A sustained thread of notoriety continued to entwine Manchester’s Band on the Wall throughout the 1950s and 60s. Waiters were reputed to carry knives – of a non-cutlery variety!1 There was a slick, Mafia-styled singer whose dark cloak was said to conceal a darker secret: a Luger pistol.2 And the band was on the wall, the musicians believed, to protect them from trouble that frequently broke out in this boisterous market pub. Then there were the ladies of the night. 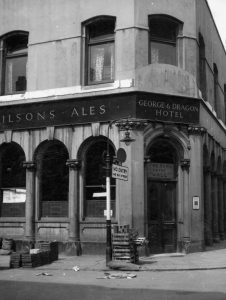 But throughout this web of infamy, rumour and furtive fact, this big old pub on the corner of Swan Street and Oak Street, where the first drinks licence was recorded a century and a half earlier, clung to its reputation as a place for music — almost as a guilty secret. Small, hand-written, paper notices, at a side window and at the front door, declared ‘THE BAND ON THE WALL’ and were eclipsed by the formal, painted signage above the door arch of ‘GEORGE AND DRAGON’, the pub’s traditional name. And on the pub’s banner fascia was the giant lettering of ‘WILSONS ALES’, the main product of the pub’s new, corporate owners, Wilson’s Brewery, just two miles away in Newton Heath. As to the music ‘on the wall’, apparently in the early 1950s, it was trad, Dad. During World War Two, a revival of traditional jazz gained momentum in the UK and by 1950 the trad jazz boom was underway. Of course, USA was The Source. In Manchester, some local musicians were able to connect with that source by hearing the latest transatlantic sounds – traditional and modern – on records brought by American servicemen stationed at Burtonwood, near Warrington, including GI visitors to Band on the Wall during, and a few years after, the War. One young, aspiring jazz musician, Mart Rodger, did not have to rely on American servicemen for his transatlantic discs: Donald*, his elder brother by 13 years, was a Lancaster bomber pilot who returned from flights to Canada with records by the likes of Benny Goodman, Bob Crosby and his Bob Cats, Artie Shaw and Chicago jazz. These records were a big influence on clarinetist Mart as a jazz-struck teenager. Now in his eighties, he still has all the records and continues (2017) to front the renowned Mart Rodger Manchester Jazz. Still at school, aged just 14, in 1950 Mart was invited to join Stan Reed’s Mohawk Jazz Band, playing Band on the Wall. The gig took an unexpected turn. 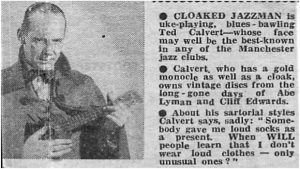 Mart recalled that ‘the police raided the joint’ [perhaps for a licensing contravention] and, because he was under-age, he ‘made a swift exit and escaped unnoticed, with his clarinet, by climbing out through a sash window at the back of the stage’. He added: ‘It was a somewhat rough joint, which attracted some dubious clientele’. Mart was not the only youngster to play Band on the Wall in those days. Pianist Mike Rogers, from Blackpool, was a schoolboy when he played a weekly gig at Band on the Wall in the early 1950s. In 2009 he wrote4 that the band had the late Alan Jackson on trumpet and sometimes featured ‘Moondog’ on drums and vocalist Ted Calvert. Ted Calvert was the vocalist who was reputed to carry a Luger pistol under his cloak. This photo and caption is from the Manchester Evening News. Ted died a few weeks after receiving terrible injuries when he was attacked by a man in Macclesfield. ‘It was still an ordinary pub called The George and Dragon and many of the customers were not jazz fans, but just regular pub clients, as there was no entry charge. Some of the customers were quite rough and I remember several fights. The theory amongst musicians was that the band was on the wall to protect them from trouble’. Another traditional band to play Band on the Wall in the 1950s was The Southside Stompers, led by renowned Baby Dodds-style drummer Don Bridgewood (1931-2015).5 The band later took up a residency at The Black Lion, Salford. ‘It’s a brave comic who is willing to share the billing with Bunny Lewis as he is a hard act to follow, he’s a terrific artist and a great comic, so don’t let the frock fool you!. 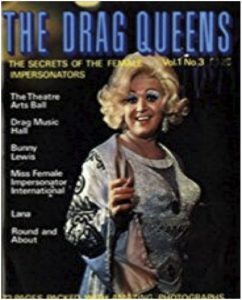 ‘Nightly live entertainment at that time consisted mainly of drag acts interspersed with such things as spoon and bone players, the occasional visits from a paper-burning act – I kid you not! – and a “Maestro of the Musical Saw”’. George also recalled that the main entrance to the pub was the side door on Oak Street, with the bar opposite and ‘the acts performed on the “stage” which at that time appeared to be an old dining room table of strong construction. The large room had plenty of seating and tables with bench seating against the walls’. He added that it was ‘a big, rough, busy pub, down to earth’. Danny’s father Daniel Young senior was licensee from 2/12/1963 to 26/5/1966. Record producer and engineer Martin Hannett (1948-1991) has been credited with creating The Manchester Sound. Among the albums he produced were those by Joy Division, John Cooper Clarke and Happy Mondays, In 1976 he played bass guitar in the Tom McMasters Band at Band on the Wall16. Stack Waddy were championed in the 60s by DJ John Peel who signed them to his record label, Dandelion Records. Their second album was titled ‘Bugger Off’. ‘… everywhere was wild, everybody wanted the popular music of the day. So it would be a mixture of the Beatles, a little bit of Motown – because Manchester was very strong even then as a Motown area. And then the vast majority of the “talent” singers would usually choose a country and western theme’. ‘Band on the Wall was the most romantic venue’. The romance of the venue apparently was an insufficient attraction to retain the long-term loyality and commitment of a succession of licensees in the 50s and 60s. Turnover of tenant landlords was considerable: no fewer than 12 in two decades, thus an average stay of just 20 months. Yet the reports we have from this period all refer to it being a very busy pub that, one would imagine, would be lucrative for the landlords as well as the brewery owners. So why the turnaround of landlords? Perhaps the accumulated stress of running a venue where fights were frequent took its toll on the beleaguered landlords? Perhaps much of the clientele was impoverished, choosing the warmth and comfort of a pub to their own homes and spending a minimum over the bar? These post-war decades witnessed big changes in the physical and demographic environment of the area of Band on the Wall. The first multi-storey office blocks of the 1950s in what is now called the Northern Quarter were said to reflect a new mood as ‘the nation was gripped by a new feeling of optimism and the nation looked forward, rather than back, to a brave new future’17. But that optimism may not have been shared by many of the local residents and workers in the immediate catchment area of Band on the Wall. ‘He arrived driving a massive big American car with yellow wheels. Rudi pressed the horn and it played a tune. I learned later it was a Chrysler Crown Imperial… it had a little record player in it. It was Frank Sinatra singing You Make Me Feel So Young’. Sinatra, famously of Italian parents (and temperament? ), came close to Ancoats Little Italy in 1952 when, following a sparsely-attended concert at The Palace Theatre, Manchester, he got very drunk with a beat policeman and, having forgotten which hotel he was booked into, was put up for the night on the local bobby’s sofa in Newton Heath, just along the Oldham Road from Ancoats19. Although Ancoats, including ‘Little Italy’ and neighbouring areas, suffered severe depopulation and increased unemployment in the 50s and 60s, the night time economy – not all of it legal – remained bouyant and Band on the Wall, probably the biggest pub in the area, remained busy. ‘There was Irish in there but mainly northern Manchester … and remnants of what was the Quality Street gang used to call in…. Even bigger, grander clubs emerged in the Manchester area in the 1960s, such as: Poco a Poco, Stockport; the Golden Garter, Wythenshawe – that opened in 1968 with Bruce Forsyth the star artist — and the Talk of the North, Eccles. Many other clubs, big and small, established Manchester in the 60s as a city with the most vibrant night-life. Band on the Wall was part of that vibrancy, if at the down-market corner of the city, and, it would appear, was unaffected by the competition from the huge, plush new clubs. Daytime trade could also be steady at ‘The Band’ mainly due to its proximity to ‘the city’s most important shopping street [Oldham Street] and its main market [Smithfield]’. But the physical fabric of the area was in decline and Band on the Wall was no exception. Reports from the 60s describe the deterioration of the building that had been subject to several adaptations over the years and was essentially in excess of 100 years old. Apparently there was little Investment in the fabric of the building by the brewery, Wilsons of Newton Heath, that took ownership following a merger with Salford brewers Walker & Homfray in 1949. The new company had a combined total of 1100 licensed houses; Band on the Wall, then a somewhat notorious venue in a dubious area of the city, was not the priority for improvement. There was no change also when Wilsons was acquired by Watney Mann in 1960. The priority for investment in the area by this London-based company was completion of a big, new bottling plant. At the close of the 1960s Band on the Wall had clung on to its customer base, despite the ongoing deprivation – close to destruction — of its immediate catchment area. And the venue continued to present regular live music. But the building, like the area, was deteriorating, with brewery neglect a contributing factor. Also, antithetical to the individuality of Band on the Wall was Watney Mann’s ‘standardisation programme’, introduced in 1969, that aimed to phase out local branding. Sensibly, this was abandoned after the company was acquired by the Grand Metropolitan group in 1972. However, in the early 1970s the economic viability of the area of Band on the Wall was devastated when the Smithfield Market moved out, followed by the building of the Arndale Centre that sucked the vitality out of Oldham Street, for many years Manchester’s prime retail thoroughfare. Band on the Wall – then highly dependent on local trade – was unable to withstand this double blow and, probably for the first time in a century, shut down. But only weeks later a Manchester former pro musician, with a business partner, would bravely take on the lease of the deserted and decaying venue. The story unfolds in the 70s section of this history. 8 Salford Soapbox, ‘From the Archives’. 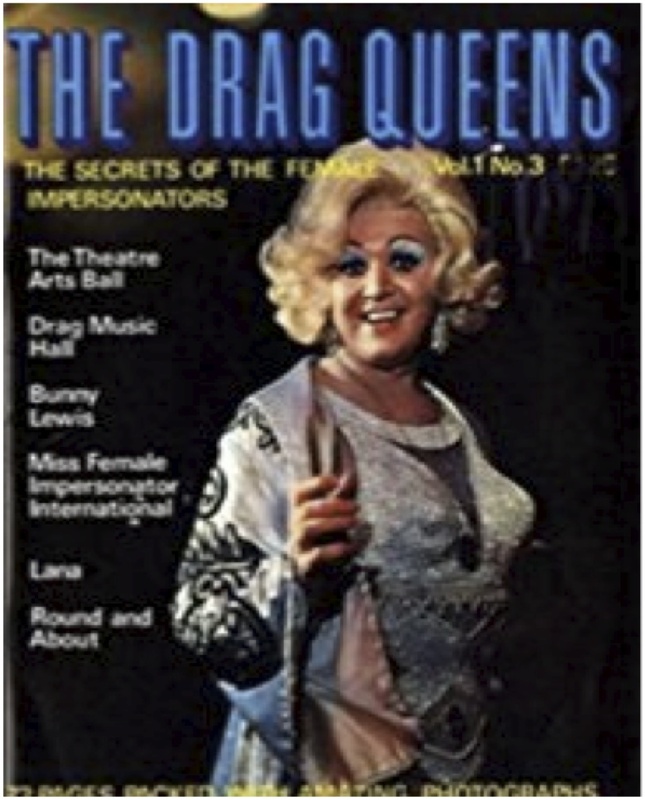 10 Bunny Lewis: obituary, The Stage, 8 December 2008.